On this video Eli covers several rare push hands methods never before published by Moontagu. We have looked through all the old videos and cannot find these methods anywhere on them, so thought it would be a good idea to put them down. There is a chance they may be briefly talked about on other videos, but as far as we can see this is the first time they are being put down on video properly. These methods were taught directly to Eli by Erle during their daily training sessions, they are no secret, but for some reason Erle didn't teach them much at workshops, so not many people know about them. Leigh Evans, Eli's training partner in the video remembers doing them with Erle back in Australia in the 90's. A brilliant variation of single push hands, it's still a circular movement as with everything in Taiji, but the circle is longer and narrower making it seem more linear than the usual method. It brings a whole new feeling to how you issue and receive the force through the different angles. 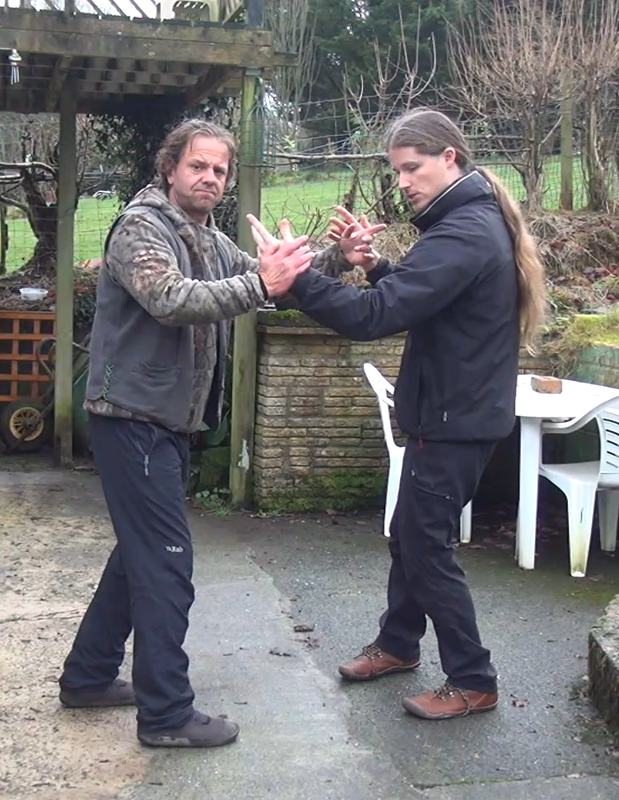 From a self defence point of view, this method teaches about dealing with strikes coming to the side of your head/neck rather than towards your centre line, and of course how to stay connected to your centre even though your striking hand will be out of your centre physically. This is a method of combining regular single push hands and single hinge push hands, teacher you a very important lesson of how to receive through one side while at the same time issue from the other. This will take your Peng structure and awareness to a higher level due to having to issue from the other hand while holing Peng. The same principle as above, but taking the linear single push hands and doing it with both hands at the same time. Four methods, inner circular, inner linear, outer circular, outer linear. Another great set of training methods, one of which is shown briefly on MTG234, power push hands. This is where we use the principles of single push hands and reverse everything, so the attacker is now pulling instead of pushing, creating a totally different body workout, to build up your back, biceps and lats.